So divine that I made it twice, because my family were aghast that I was delivering the first to my friend without letting them have a slice! 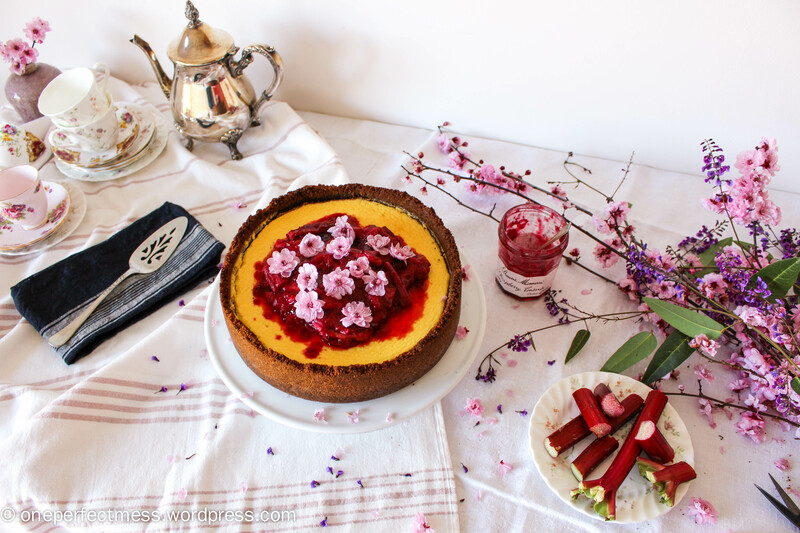 I covered the second version with fresh raspberries, which added another dimension of deliciousness. Also, I used gluten free ginger nut biscuits the second time around to cater for my dear Grandmama’s dietary needs, and it turned out just as splendidly. The filling is based off this Food Network recipe, and the base is an alteration of this Donna Hay recipe. On another note, life is zooming by at the moment and I feel as though I’m planning out my weeks hour-by-hour to fit everything in. I flagged this with a friend the other day, and she emphasised the importance of respite, then asked me ‘But are you enjoying all of these things that you’re doing?’ And I realised, I don’t think I’ve ever been happier! It’s excellent to have so many opportunities available that I can busy myself with activities/friends/studies that I truly love. Actually, the busier life is, the more I feel I’m living it. So have a busy and productive day, and be sure to fill it with things that give you fulfilment and joy. Then have cheesecake. Grease and line a 26 cm/10 inch spring form cake tin. Break the biscuits up and blitz them in a food processor until a fine powder forms. Stir the butter in a small bowl over medium heat until just melted. In a medium mixing bowl, use your fingers to combine the biscuits, melted butter, almond meal and ground ginger until the mixture is the consistency of wet sand. Press handfuls of the mixture into the base of the tin, using up about half of the total amount. Use the base of a flat sided glass (or thermos, jar etc.) to press the base down firmly and evenly. Now, press handfuls of the mixture against the sides of the tin, right up to the top. Roll the sides of the flat sided glass against the crust to to press the mixture firmly against the tin, and try to get it as vertically straight and even as you can. Pick up any crumbs that fall off as you go, and pat them down into parts of the base that are a little thin. Refrigerate for at least 1 hour, until firm. Preheat the oven to 170°C/340°F fan-forced. Fill a large roasting tray half way up with water, and place in the lowest rack of your oven. In the bowl of an electric mixer, beat the cream cheese and goats cheese on medium speed for 3 minutes until light and fluffy. Scrape down the sides of the bowl, add the sour cream and beat for another 2 minutes until smooth. Scrape down the sides of the bowl again. Crack all of the eggs into a pouring jug. Turn the beater to low speed, and add the eggs 1 at a time. Beat for 30-45 seconds between each addition, to ensure each egg is fully incorporated before you add the next. After beating in the last egg, scrape down the sides of the bowl, then beat again on low speed for 1 minute. Add the sugar, vanilla and lemon zest, and beat on low speed for 1 minute to just combine. Pour the filling into the prepared base, and place the cheesecake on the oven’s central rack, above the water bath. Don’t place the tin in the water bath, or moisture will leak into the cake as it bakes. You just want the steam from the water bath to reach the cake. After 25 minutes, rotate the cake and cover it gently with foil to prevent it from browning. Bake for another 30-40 minutes. 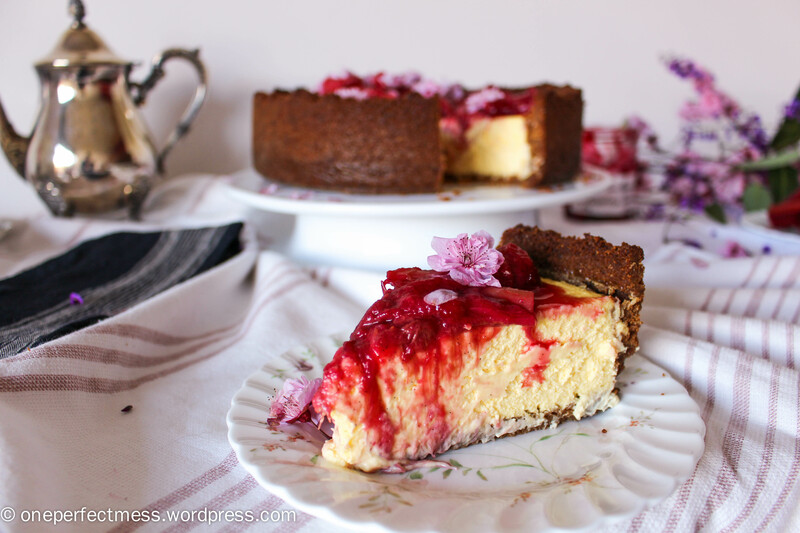 When the cheesecake is perfectly cooked; a metal skewer inserted into the very centre will come out with a little wet batter, but it will just be coated in moist crumbs with inserted around the edges. The cheesecake should have a good wobble to it. Don’t be tempted to over bake, as it will continue to cook as it cools, and refrigeration will help it to set! 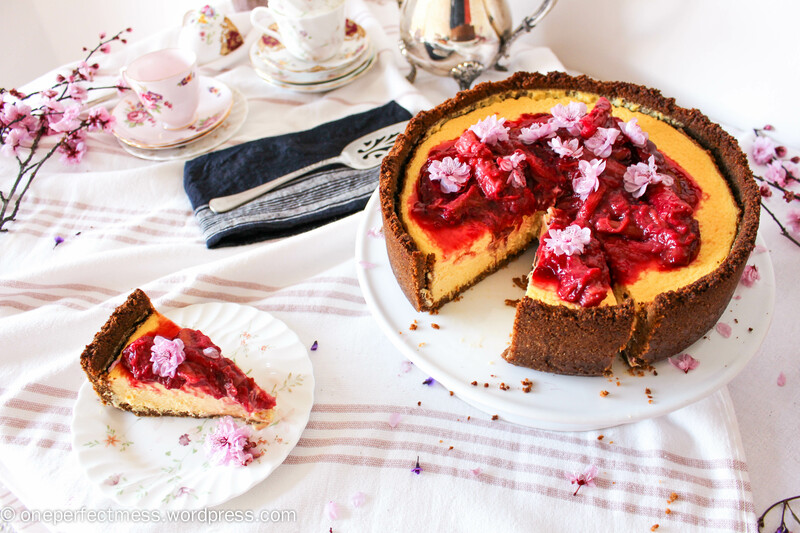 Turn the oven off, open the door and leave the cheesecake inside to cool down slowly for 1-2 hours. Refrigerate for at least 8 hours, or overnight. Wash the rhubarb, then slice any funky-looking edges off of each stalk. Cut the stalks into 1 inch segments. Combine the rhubarb, lemon zest and juice, ginger, raspberry jam and water into a medium saucepan. Slice the vanilla bean pod in half, and use a teaspoon to scrape as much of the paste into the saucepan as you can. Throw the rest of the pod in too once you’re done. Bring the fruit to the boil over medium heat, then turn the heat to low and simmer for 3 minutes until the rhubarb is just tender. Remove the rhubarb using tongs, then cover and refrigerate. Bring the remaining syrup to the boil and stir constantly for 5 minutes until thick and sticky. Cover and set aside at room temperature. Gently slide the cake onto a serving plate. Brush any burnt edges of the crust off, gently crumbling them off the sides to avoid any falling on the surface of the cheesecake. 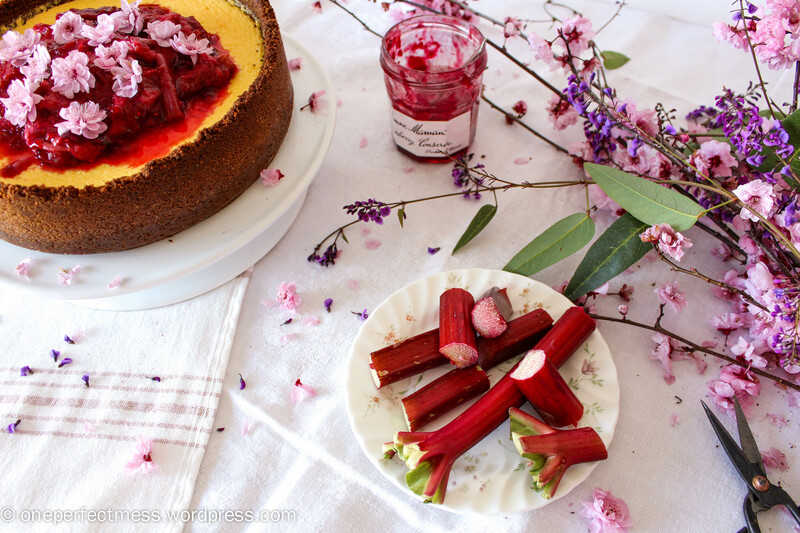 Use tongs to arrange the rhubarb on the surface of the cake. Pour the syrup generously over the fruit. Slice with a sharp knife and serve to very happy friends! 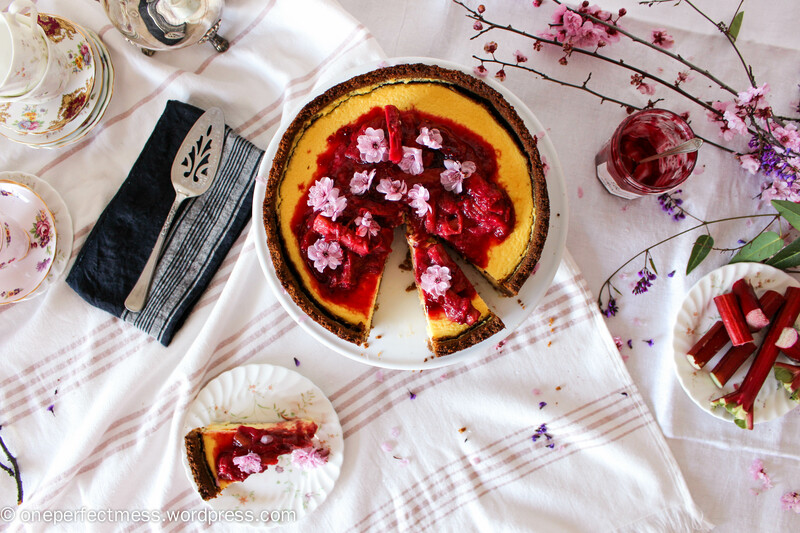 Cover and refrigerate the cheesecake for up to 5 days. Best served the day after baking.